The Audiovisual Archives are located on the 4th floor of the Marvin Duchow Music Library in the Elizabeth Wirth Music Building of McGill University. The archives may be consulted by appointment during regular service hours from Monday to Friday, 9 a.m. to 5 p.m.
For those interested in tracing the history of recorded classical and jazz performance, the Audiovisual Archives contain an extensive collection of music in a variety of audio formats such as 78s, 45s and LPs, transcription discs, reel-to-reel tapes and cassettes, as well as various video formats. 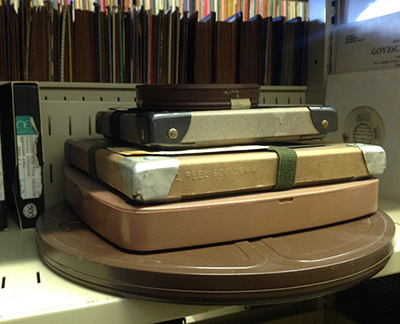 As the preservation of unique performances on obsolete formats is of global concern, the McGill Audiovisual Archives is playing a vital role in providing continued access to its unique collection for current and future students, teachers and scholars. Highlights include the 78 rpm 10” jazz collection, former personal collections of David Edelberg (Handel), Noël Vallerand (Mahler/Wagner), and Eric McLean as well as Schulich School of Music concert and studio recordings. For more information about these or other collections, please visit our special collections page or ask a library staff member for assistance. Consultation of materials available by appointment.